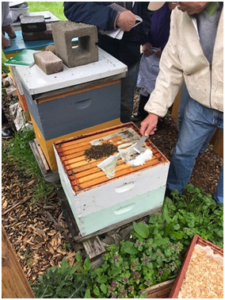 Screen Bottom Boards (SBB) have a number of uses in our bee stewardship and are widely substituted for a solid bottom board. A 1939 Delaware beekeeper removed his solid bottom and left his colony open at the bottom, which he termed “bottomless” beekeeping [There truly is nothing “new” in our beekeeping practices]. Although many beekeepers use SBB to control varroa, BIP and PNW surveys point out they are not a highly effective varroa mite control tool. 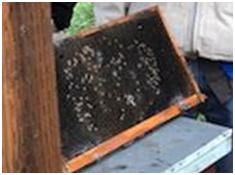 Our PNW Honey Bee Survey asked respond-ents about screen bottom board use. 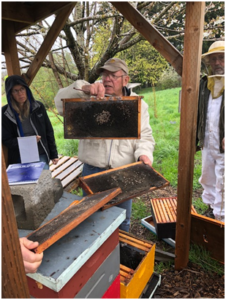 Among Oregon and Washington hobbyist (backyarders or small-scale beekeepers) in the 2014-15 survey year, 79% of the 250 respondents said they used screened bottoms (66% used them on all their hives with the remaining 13% using them on a percentage of their hives). In 2015-16 period, 140 individuals used SBB on all and 41 individuals used on some of their colonies (74.4%) while 62 individuals DID NOT use SBB 25.5%). For 2016-17, 178 individuals used them on all their colonies and 46 did on some for a total use of 83%; 17% (47 individuals) DID NOT use them. For the most recent year 214 individuals used SBB on all their colonies, 40 on some =80% while 63 individuals did not use SBB 20%. The numbers have been consistent each year with range of use on all or some of hives from 74.4 to 83%.. 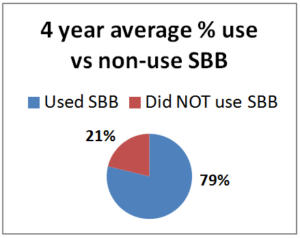 The graph shows 4 year average of number of individuals who used SBB (79%) vs those NOT USING SBB (21%). 2017-18 season, the loss rate of those using SBB on all or some of their hives was 38% vs a 39% loss rate form those 63 individuals not using SBB. In three of four years there was a slight advantage to use of SBB with 1, 2 and 13.4% greater survival rate. The four year average – 41.3% loss level of those using SBB and 43.4% for those not using SBB (a 5% gain) illustrates how they are very minor in improving losses overwinter survival. We also asked whether they blocked colony SBBs during the winter. IN 2014-15, the majority (51%) left them open over the winter period (never response), 19% sometimes blocked them and 31% said they closed them (always response) during the winter. For the next two seasons the majority response was to leave the screens open at the bottom of the colony overwinter. 2015-16 56% left open vs 26.5% closed and 2016-17 50% left open vs 31% closed. This past season 39% left them open, 17% sometimes did so and 44% closed them. When we examined winter losses for this response, there was an improvement in loss when the SBB were closed (24% vs 31% in 2014-15 for example, 39 vs 32% in 2015-16, 53.5% vs 36.6% in 2016-17 and 42% vs 37% this past winter.) 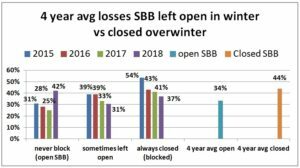 Comparing the always blocked the over winter response with the never response and sometimes (left open) results in a 10 percentage point difference in favor of closing the SBB over the winter period. 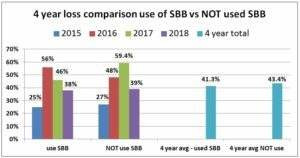 With our Bee Informed National survey (www.beeinformed.org), use of SBB did not improve winter survival rate in any of our survey years when we directly compared their use with loss rates. However in survey year 2013-2014, northern beekeepers did have about a 10% decrease in losses when SBB were used compared to southern beekeepers. Experimental studies on SBB and mite population levels show either no or this slight, ~10%, improvement in reducing mite population levels when SBB are used. A Screen bottom board is a multifunctional IPM tool. 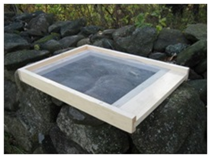 Using a screen bottom aids greatly in hive ventilation. It can be used with upper entrances at the covers or with ventilation ports added to hive bodies. Air circulation for better ventilation can be further aided by pushing the outer frames inward a bit to allow air circulation upward between the outer frame and box wall. 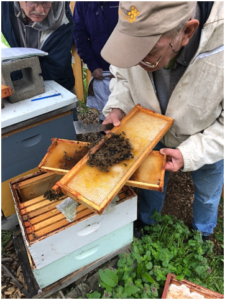 Heavy burr and brace combs, sometimes due to incorrect bee spacing between the hive boxes, when both the bottom bar and the dropping of the top bars below the rim creates a ½ inch of larger space, and heavy propolis use in the fall, may reduce good air circulation in the boxes. During winter, beekeepers at more northerly locations or higher elevations often close or reduce the screen opening beneath their colonies. This is thought to e useful to have the queen use more of the lower box for egg laying. Since clusters are in the top box in early spring and European bees are slower to expand downward more slowly this potential negative can be easily managed by reversal of brood boxes in the mid-spring. It is not advisable with an open screen however to have wind blowing into and through the bottom of a winter colony. An air space beneath the colony, with screen bottom board left open, is not detrimental to colony wintering. The dead air space and, moderating soil temperatures may be helpful. Often this dead space beneath a screened bottom can be created with hive stand configuration. The greatest benefit of a SBB is as a mite monitoring tool. It is a key element in knowing HOW MANY mites are present since we know that most likely mites are already in the colony, There are some SBB that make this monitoring, getting our mite number assessment, easier than others. SBB with mite monitoring boards are the most useful. You can make your own or purchase such boards. Designs that allow you to insert the monitoring board with minimal disturbance are best. However you can make your own and use petroleum jelly to trap fallen mites and a wide putty knife to clean it for reuse for very little expense. Reading a mite monitoring board beneath a colony can be difficult. Mites are tiny and hard to see (use of pow-power magnifier and strong light can help focus the board assessment. Leaving a monitoring board underneath a colony for a single day or 2-3 at most will help reduce debris drop. If bees are cleaning out old pollen, are uncapping brood or honey cells or are heavily bringing in nectar or building new comb can result in higher levels of debris. Ants may enter and feed on the mites. seeds from grasses or nearby plants that blow into the hive and land on the screen board can greatly confuse the counting. 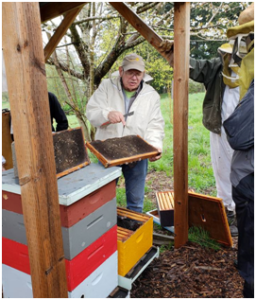 About a dozen brave individuals gathered at the Zenger apiary colonies Sunday April 15th, during a steady Oregon liquid “sunshine” rain for dead colony forensics with Dewey. Photo right by Mandy Shaw. Temperature was low 50’s, with only a couple foraging bees venturing forth from 4 of 8 colonies. We hefted boxes and did autopsy on two dead-outs. Bees die overwinter for a number of reasons. By doing a dead colony autopsy we seek to determine what might have been the likely reason for non-survivorship. Understanding the why might help us avoid a repeat this next winter. The first dead-out we looked at (photo above) proved to be a tough diagnosis. The colony was a mid-May nuc donation from Beetanical apiaries of Lane Co. Hive had a standard and a shallow. The shallow frames were quite full (>3/4ths of cells) with capped honey. The shallow was lifted off and placed on upside-down cover. There were dead brood remains on three frames of the lower standard box plus a small (<2000) number of dead adult bees on the screen bottom board and outside the entrance. Two adjacent frames had widely scattered capped brood cells extending in an oval covering over 1/3 of the middle of the frames; there was a fist-sized patch of compact capped brood but it was not contiguous with the scattered brood of the other two frames. There was no evidence of a dead cluster but a considerable number of cells of stored pollen on 5 frames. Ample mold was evident in pollen cells and as a powdery grayish mold on surface of cells. Colony was sampled for mites with a sugar roll in September and had only 2 mites (<1%). It was NOT treated for mites as it was a non-treatment control. Colony was alive in a mid-October inspection. Photo of the three frames with brood shows the frame with a patch of compact brood (held in my right hand) and two frames with very scattered brood (one in my left hand and the third on top of adjacent hive; this frame is shown isolated in photo right). Full super on ground. Photos by Deb Caron. So what can we diagnose? Lots of honey and pollen stores so we can likely rules out starvation. Small number of dead bee bodies suggests a small colony but if we would believe death from a too-small population of adults, there should have been evidence of a cluster with bees within cells and dead bee remains on the frame(s). There wasn’t. Thus our best guess is a colony that had a BEE PMS condition. The scattered brood remains on both sides of the two frames suggests this –a spotty (snot) brood situation MIGHT have been diagnosed in the October examination, but this requires a close examination of the brood; we might have noticed evidence to too few adult bees to cover the brood – both are subtle clues. The fist-sized brood area, one frame over from the other two frames with scattered brood, might have been bees trying to escape the high mite numbers and their unhealthy brood of the 2 frames with scattered cells. Adult bees were likely dying prematurely and abandoning their (unhealthy) hive, thus the reason we saw only a smallish number of adult dead bees. The colony likely failed to rear sufficient fat, fall bees. The colony probably died within a month after the last October inspection, probably from a virus epidemic related to the mite infestation. NOTE: The September mite sample is misleading/confusing (we would expect it to have been higher); if an additional sample was taken it would perhaps have been higher? The second dead-out was a more standard necropsy. Hive was a spring split,that struggled all season. It had 2 shallows. Colony had a 19 mite count (6%+) in September and was treated with 2 formic pads between the two boxes. It was alive in March (this spring) but noted as small. It was fed dry sugar on paper (some still remaining) and provided with a frame of sugar candy. Opening the top and removing moisture trap, (all Zenger hives had moisture quilt traps at top) showed a dead cluster of adult bees on 3 frames in top box at top of the box extending down about ½ way on the 3 frames (see photos; in photo right, hive tool is showing the remaining dry sugar on paper – quilt trap with wood shaving lower right). The adult bees were black and showed excessive moisture; there were many maggots (scavenger fly) feeding on the dead bees. There was capped brood in compact pattern within the cluster. Dead adult population was small (perhaps 8-10,000 bees). There was NO capped honey in any of the frames of either box. Lower box was empty. There were some dead bees on solid bottom board. There was little mold. So what was diagnosis? The dead cluster is characteristic of a colony that overwintered the tough months (Dec-Feb) and moisture of adult bees, maggots and little mold suggests recent death. The compact brood shows the colony was starting to expand in the spring (flight was noted in March). Although dry sugar (as candy and crystal sugar) was given as emergency feed (hefting would have revealed lack of enough stores), it turned out to not be enough — colony likely starved. Bee cluster too small to generate enough heat to make slurry out of dry sugar or candy so bees couldn’t use it. Photo below shows one of three frames. We see “bee butts” under the dead cluster and compact capped brood. Photo by Deb Caron. All frames, except one with high number of drone cells, could be reused for anew colony installation (package, swarm, split). Brush off dead cluster and from bottom board. If inclined wash mold with bleach or vinegar solution.